For a business to stand out in the crowd, it needs to state very clearly what problem it solves and how its approach is different from the rest. Your unique value is an extension of your own unique qualities and experience, especially your sacred gift. 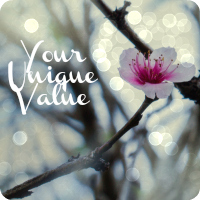 Your unique value is associated with your brand. Your brand is your business name and the feelings and experiences that people associate with it. Your unique value highlights your unique approach to fulfilling your vision for a better world. If you have any questions, you can add them to the spreadsheet as you go.